Spring means fresh tees or tops, or at least a look at what the Pantone prophets have decreed as current colours. Women for whom "budget" is not just a car rental company choose their price point and hope for colours they like, but the butter yellow tee offered last spring may have been replaced by nearly-neon lemon this year. The hardest thing to find in mid-priced clothing is appealing colour, which is created by good dyes applied to good fabrics. Many women stack black, grey and white into drawers in a default strategy generously called a "neutral base". We do love neutrals, but hey, it's spring. And besides, if you have sensitive graydar, even that colour is suspect. You may long for luminescent dove grey or that mysterious grey-with-a-wisp-of-blue, but 90% of mass market retail delivers Parking Garage. Some women wear the spring 2018 colours below superbly, but to me, and therefore on me (since colour is potently psychological) these dyes look either harsh or flat. If you like cool hues and colours more on the desaturated side, you'll have to search this spring. 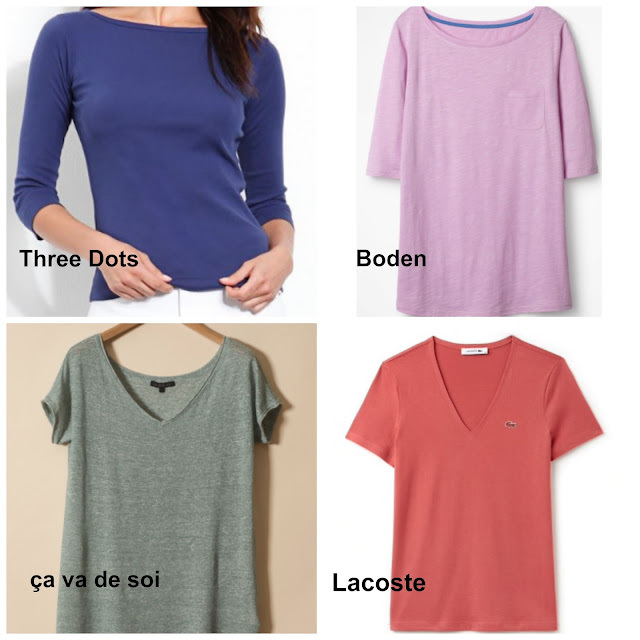 Talbot's scalloped-neck tee in "Deep Periwinkle": I actually like periwinkle, but this is more towards a blue on steroids. Talbot's Everyday tee in "Nectarine": pretty colour, especially on a blonde, but when I saw it in person, dull—maybe because it's a cotton blend. Land's End tee in "Burgee Blue": muddy turquoise with none of the island appeal. Private-equity firms own these companies, and they use jobbers for fabric for all their lines from super-cheap to mid-priced. I think they don't care about colour and cut corners every way they can. Do you have an alternative reason for the glut of harsh magenta? So, is it another one in... navy? You might find an interesting green at the Gap, or 'your purple' at Target; that's luck. I'd like to find a refined, interesting colour selection in one place, and then, refresh every year or two without a search. Very good colours, but too often sold out. The reds are impressive, because most makers offer only one. TD have several, from claret to tomato. Above, their "Tide" tee, less strident than the "Burgee Blue". Boden have been called "a kid with a box of crayons, run amok"; there is a fondness for harsh primaries, and some of the prints look juvenile—but this is not Etro. Even so, they offer some non-generic hues, like Rosebay, shown in a boat-necked tee. Their men's polos have always incited my craving for the same choice for women. No such luck, but they offer eleven colours in a tee, if you can wear the narrow cut. Above, Lacoste tee in a washed-out red they call Sierra, which you can sometimes find at LL Bean, too, in a boxier cut and more sizes. Expensive, but of elevated quality. The colours, always subtle, purr on fine fabrics. Shown, "Tatiana" tee, Egyptian cotton and raw linen, in Palmier. Now available online. If you love saturated colour but in unusual hues, such as twilight blue-purple, or that pink like the inside of a brick, you are doomed to being a colour sleuth, hunting all over the place. Just give me a scarf! 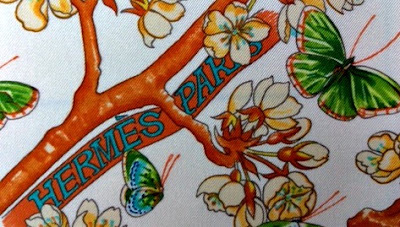 Hermès carrés and pochettes for sale*. These are my from my collection—and the colours are sublime. I find those colours very aggressive, don't really like even most of the bottom row. I love green, but it is so hard to find a green that isn't very yellowish, either the light ones or the dark - always a sort of olive, and without the silvery side of shimmering olive trees. I have found some decent colours and fabrics (though the fabrics obviously aren't comparable to ça va de soi) at Simons, in the Icône and Contemporaine ranges. These include a couple of very low-priced organic cotton tops, long and short sleeved. I can't wear ça va de soi anyway because even though I've lost weight, I need an xl in the bust; can't stand tops that pull there. There are some good linen tops at Simons every year, but at times they are muddy. The colours in the ça va de soi men's range look splendid. Laura Jantek: Yes, sports clothing is also prone to weird colours. Patagonia's are the most consistently pleasing to me but even then, you have to choose. lagatta: ça va de soi do make several styles that are looser, oversized (relatively, for them), that IMO would fit, but I'm not sure the length would be right for you- you really can't tell from the online site b/c they do not give measurements. Simons usually have a big selection and some excellent sales. Duchesse, thank you for my morning giggle - "... but 90% of mass market retail delivers Parking Garage" - so true! Why is it that many times the men's colour range is so much nicer? I've noted that for years. Frustrating. Colour is important to me, I like to wear it but only if it's 'right'. As you note, I fall back onto scarves a lot of the time. Subtler colours seem to work better with our grey weather from late fall to spring but are much harder to find. Brighter colours, even if a bit flat, seem to work in the summer with the sun to counter balance. Agree that Talbot's has fallen down a hole, the only reason I still look there is the pants fit me somewhat better than others...not that they're perfect. They discontinued my perfect fit a few years ago. Haven't heard of Three Dots, thanks for a new source to check out. Love the fabrics at ca va de soi, the fit and colours not so much. The search continues...but this really shouldn't be so hard. My biggest beef is that it is very difficult to find CREAM coloured knit tops and tees. White just does not work with my skin tone - cream is perfect. I sew too and can't even find cream fabric! I've started trying Kettlewell Colours. They offer an amazing range, although sometimes the styles I want aren't available in the colors that will fill gaps in my wardrobe. Their shipping from the UK is quite fast. And speaking of grey, they offer a high-hip length shawl collared open jacket (cardi?) in pebble grey that is a slightly warmer and lighter grey than I've seen elsewhere. It actually looks good on me and is the first grey I'm willing to wear. I just refuse to fill my closet with "neutrals" - so boring to look at in the morning! More and more I find myself moving away from coloured -shirts (the ones still in my wardrobe are used mostly around the house and might make it outdoors for a trip to the grocery store. I always found the colour ranges in most stores to be either a wishy washy pastel or aggressive (love how you termed those brights). I'm going to stick to black, navy (stripes in both) and then white. The one company that I've found decent quality t's at a reasonable price is LL Bean. I also like that their t's come in a variety of necklines and sleeve lengths. I need a 3/4 sleeve if I'm wearing a t-shirt on it's own and those are very difficult to find. I think it might be time to place another order for a few new white ones! PS - scarves are always a good choice! Duchesse, this is so true ! One of my recurring disappointment is looking at those gorgeous new Pantone colours when they come out....... and finding clothes in stores in various shades of black, white, grey, burgundy, blush (a colour that I hate and is unflattering to most), khaki and more black. All unappealing. I wonder who uses all those "Fashion" colours ? nobody, it seems.... but I remember buying an emerald i-pod when emerald green was "colour of the year" a few years ago. I need good strong brights. The more muted colours just wash me out with my pale skin and grey hair. The 'Harsh magenta' is actually one of the very best colours for me. The Queen has just stepped out in it at the Easter service and also looked stunning in it, though every colour seems to suit her. We are both what is known as a 'winter' person so what looks good on me is the jewel-bright winter colours and not the autumnal oranges or muted pastels which would suit you. I often use the UK brand Kettlewell to find good quality clothes in any colour imaginable. They have coded each colour by a skin season so you can tell by the code if that colour will suit you. Some colours are good for springs and winters, others might be summers and autumns, some are good for all skin season types. It is a rather fun way to look at clothes. The Queen did look stunning in that; I couldn't imagine wearing such an ensemble, even thirty years on. But of course it is in the finest woollens and the finest dyes - that colour could look very downmarket indeed in shoddier ones. An odd thing is that in great age I find that she looks far more relaxed, serene, and somehow happy. If that is your garden in the photo her ensemble would be lovely against it. And she is SHORT! Like most everyone, she has lost some height with age, but she was never very tall. That is also one of the reasons she has almost always opted for bright colours, unless an event called for white or black. LauaraH: Three Dots are good quality but do not seem to have their inventory right as they sell out online of sizes above XS and S almost instantly. Kamchick: Agree, though I don't wear it. A certain khaki is everywhere, but not that unctuous beautiful cream. Eve Benoit: The fashion colours are out there, often in designer clothes (see net-a-porter for some) but most retailers play it safe. But i learned the hard, expensive way that just because I find a colour beautiful, it may not look good on me. Ann: Thanks for reminding me, they have tons of colour in many different saturations. royleen: Oh yes, and there we can find colour galore! Melissa Hebbard: I am a true winter, and I do not wear harsh jewel tones, with the exception of a bit of it in a scarf. As I wrote, the effect of colour is psychological and jewel tones make me feel jangly. I admire them on the Queen, and I like them on others and agree with lagatta that quality is the key. The Queen has the jewels, not just their hues on fabric. I like Kettlewell's site and it's great to hear the quality is good- have never ordered. Thank you to the two readers who mentioned Kettlewell. Their selection looks good, the colours are great and the styles are a bit more relaxed than Three Dots which seems on the tight side to me. I also like Petit Bateau tees. They are good quality, but limited in color and size. The V-Neck for summer for example has only 6 colors. I'm between size 12 and 14 and wear Size L which is their largest size. American Vintage's "Jacksonville" offers a lot of subtile shades, but the fabric is very thin and gets little holes quickly. Lighter colors fade away after a few washes. But great for hot summer days, they are airy and don't cling to your body. ca va de soi is wonderful. Unfortunately not available in EU. LayraH: Three Dots is not so much tight as cut "missy": the armholes are cut on the high side, and the overall line is narrow. I would say, like J. Crew's Perfect Tee. Melissa O'Neill: I really like Uniqulo tees but their service for online shoppers is not the friendliest and the low price is wiped out by shipping and import duties. (I buy them when I travel.) It's easy to track down a good white or other neutral, depending on the style and price a woman wants, but even with those, you may find from year to year the cut or fabric content has changed. Barbara Schieren: I am that size too. Your American Vintage tee is a blend of cotton and viscose, which gives it a nice drape. Pricey for that quality. Well, this is a timely post. I was looking over my tees this past weekend. I have 100% cotton Eddie Bauer tees that are nine years old (per date of manufacture tag in seam). The color is still vivid and the material is smooth. I also have cotton/poly blends from Target that are a year old and are un-wearably nubby. Why, oh why, are we sold these feather-weight, layering tees? They're junk! While I can't attest to the quality of their tees, I do like Uniqlo's color numbering system. I own a #10 pink shirt and sweatshirt and I know a #10 tee would match. I always like to see colors in person. I don't trust a computer monitor. Golly yes, color as we write here -- we are not grade school kids with the 12 color box! That's one of the first admonitions in painting class -- never straight out of the tube. Mix and use all the tricks in the book to get yourself something subtle, unique, or accurate. I guess that's why I love the secondary colors year round even though I'm a jewel bright winter person. Spring orange can go tangerine or apricot, spring green can go lime or chartreuse, spring violet can go orchid or periwinkle. J. Jill sometimes has an interesting color in the mix, but you have to search. Grr. Happy hunting! Jane: I automatically stay away from tees described as "layering" if I intend them to be visible. They are flimsy, show too much, and even the 100% cotton gets abraded very quickly. dana: Writing this post led me to a few sites on colour theory, which I enjoyed. I've been obsessed with textile colour for a few years and I cannot find anyone who is willing to say why colour looks so cheap and monochromatic, even on "bridge" priced clothes. I notice many more clothes of the subtle hues you describe when I am in Europe. Also, the North American market seems to •want• those primaries. In France, Italy and Scandinavia for example, I notice that women will wear that brown with purple in it, or the unusual greens. Women will dress their infants in pinky-taupe. I wonder if in North America we have accepted what we can get and trained ourselves to avoid the less-common hues. What do you think? A friend traveled to France and Italy and noticed how complex the colors and textures of materials were, beautiful weaves. Back in the US, it looked to him like everyone was wearing clothes made of a stiff, flat cardboard. I love vintage clothes and imported clothes (Indian Madra, Scottish woolens) with something special: natural fabric, beautiful drape, special detailing, "imperfect" textures. Re. N. American penchant for crayon colors: I can't speak for Canada, but the U.S. has a primary color flag and overweening patriotism; perhaps that's it? We're so in thrall to the mass market we just take what they give us? So few of us relatively can even bother to look for interesting colors? Option b: interesting prints. I'm wearing a nicely fitting old cotton sweater with burgundy, tangerine, and hot pink "dabs" on white. Target. I love to wear color and combinations of colors but not garish colors, which seem to be what is available now. Subtle, "off" colors are interesting to me. Overdyeing is sometimes necessary to get something interesting but that is a skill many don't want to bother with. Yes, overdying is fun and a little risky. I've put in linen, silk, cotton all in the same batch and each garment sucked up color differently. If I don't like something I can re-dye in a darker color. I like the element of surprise and delight. Risky: Natural fabrics may shrink from hot water and hot dryer. I don't mind as often I start with somewhat oversized men's shirts in lovely fabrics. Previously invisible sweat stains come out darker. Could be cut out and made sleeveless if one was gifted with sewing prowess. Or refashioned. I like reading about pao's sewing adventures on her project minima blog. tess: Yes, some countries have, or have revived, pride in their textiles. When I was in India, I bought many, many scarves and shawls in silk, wool and cotton, because I had a plan: to take them out gradually, or give as gifts. But there was plenty of cheap poly and synthetic blends, especially in non-export quality clothing. In France and Italy, you will find a range of fabric quality, but the high end is finer than North America. dana: Intriguing theory, yet- the French flag is red, white and blue, and the Italian, red, white, green. (Flags are generally bright and primary colours.) I don't find interesting prints much easier to find, or I like the print but not the palette. I was always this picky but now I find the selection narrower. one of the main reasons why I buy Eric Bompard and Brora cashmere (besides the fact that I need it here a good 5 months of the year), is for the unusual colours, whether sober or bright. Carol in Denver, and tess: Dyeing is either an artistic pursuit or a rescue operation, and sometimes the former becomes the latter. I have done some of it (when I had a yard, to deal with the mess). Now I just want to be able to order good colours and be spoiled by a little parcel on my doorstep. I've over-dyed several items. I'm good at it, but I do have a background in fine arts. I want to remind everyone that nowadays there are good cold dyes; actually they involve a bit of heat, but shouldn't shrink cotton clothing. Dylon (UK) is a good one that can be bought in small quantities; Duchesse, at the corner of St-Hubert and Faillon. There are others that can be ordered or bought at fine arts and crafts shops. I bought a very good quality denim shirt/jacket at a church bazaar, but never liked the faded blue. I over-dyed it green. Yes, be careful of existing stains, including those on weathered denim. I do dry the items on my balcony, but must make sure that there is no dripping (They are pretty much dry when I do that; it just helps fix the colour) as I don't want to adorn my downstairs neighbours' laundry with artistic spots! I wash the dried item alone in the machine the first time, or several times by hand. I bought a tencel denim-color shirt at a thrift and overdyed it using an orange dye. The shirt came out as I was hoping, a very nice rust color. I hear you in this post! I am currently searching for a navy blue shell in a mostly cotton that feels good on the skin (not too slick and certainly not shiny at all). Also, not tight and of course not too loose. I've looked all the usual places. I agree that the harsh garish colors are terrible. Private equity funds are not doing anyone but themselves and their investors any favors.